The Kilmarnock midfielder's challenge on Ryan Jack could draw the attention of the SFA. 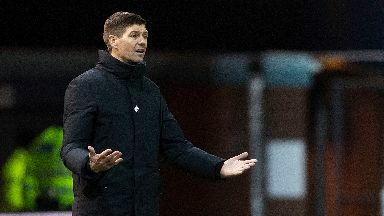 Rangers manager Steven Gerrard admitted he would watch with interest whether any retrospective action results from their goalless William Hill Scottish Cup tie at Kilmarnock following Alan Power's high challenge on Ryan Jack. Rangers had the best of the chances in the fifth-round tie. James Tavernier saw a 15th-minute penalty saved by Daniel Bachmann following Kirk Broadfoot's handball, and Jermain Defoe missed a glorious late opportunity after some rare slackness from the hosts. "I thought it was a decent game considering there were no goals," Gerrard said. "I'm satisfied with our performance, I'm satisfied with our clean sheet. "We came here to get the job done, unfortunately we couldn't do that. "When I analyse the game, I think we lacked a little bit in the final third maybe. Jermain had that one chance at the end but I'd like us to provide a little bit more invention. "But defensively we were really, really strong. Besides a little goalmouth scramble, we were perfect." Power did go off early in the 58th minute after a clash of heads with Ross McCrorie and Rangers dominated after the Irish midfielder was replaced by striker Kris Boyd. Killie boss Steve Clarke, who had no "big complaints" about the penalty, said: "I took that opportunity to go 4-4-2. We wanted to win it here and I put Kris on, went two up front. "But at that time Rangers had a better grip on the game than we did. I don't think it was so much to do with the formation. "I actually lost Aaron Tshibola in the warm-up, he felt his thigh go. That could be another reason why we didn't change a third midfield player." Meanwhile, the two managers played down their midweek spat, which saw Gerrard accuse Clarke of a lack of class for trying to get Defoe banned for diving. Gerrard said: "There's nothing to straighten out really. I'll go in now and have a beer with him and we'll move on." "There's no problems. It's all part of the game, no worries at all with Steven. We'll have a good chat.